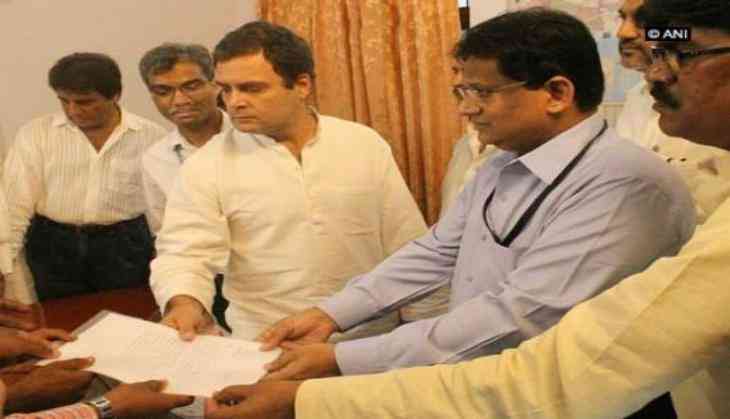 Congress vice-president Rahul Gandhi on 1 August met National Highways Authority of India (NHAI) officer Rajiv Agrawal and handed over a memorandum over farmers' land issue in his constituency Amethi. The Congress vice president reached NHAI office demanding compensation for farmers in his constituency Amethi's Jagdishpur in connection to the expansion of a highway towards Varanasi. "During our UPA regime we had built a network of National Highways across the Uttar Pradesh. Around six national highways were developed in Amethi, Raebareli and Sultanpur region. But, in Amethi this has come to light that people's land are being acquired but proper procedure are not being followed. So, we raised this issue before the National Highways Authority. They said that they will look into the matter," Rahul told media. He also demanded that proper procedure should be adopted to either compensate the affected people or the bylane be shifted. Asserting that he has been fighting for farmer's right for a very long time, Rahul said Prime Minister Narendra Modi tried to scrap the Land Acquisition Bill which is the backbone of the Congress.